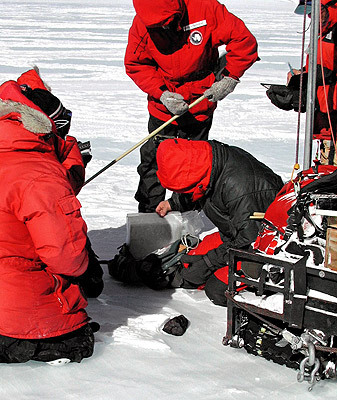 Space Science in Antarctica, why is this a good place to study space from? Unlikely as it may seem Antarctica is the best place on earth from which to study space, whether looking up through clear, calm, dry and empty winter skies, to making a giant neutrino detector or for finding meteorites that the ice gathers together and then highlights as dark against white. 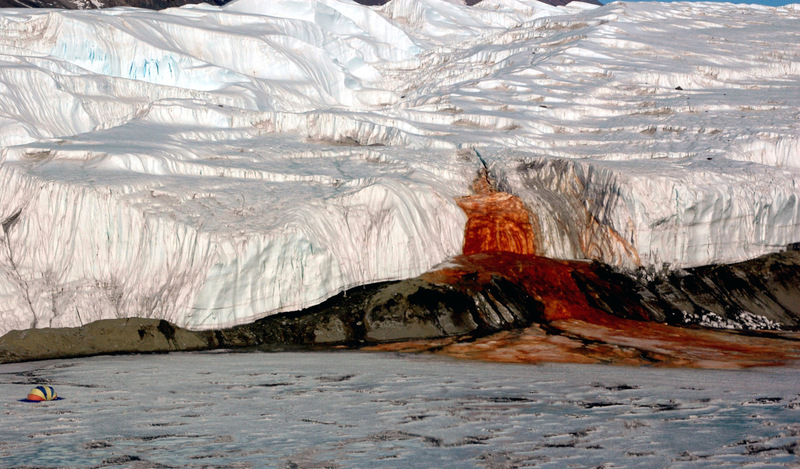 As well as being a great place for space observatories, conditions in Antarctica are the closest place on earth to the surface of Mars, and to the icy moons of Jupiter and Saturn. So it is used for testing equipment and getting an idea of what the conditions might be like there including the chances of finding life. The dry, cold and stable air above the great Antarctic ice domes in the winter time give the best conditions on earth for observing space, a combination of the darkest skies and the most transparent atmosphere conspire to make it almost as good as being in earth orbit at a fraction of the cost and with the relatively easy ability to change or service the equipment being used. 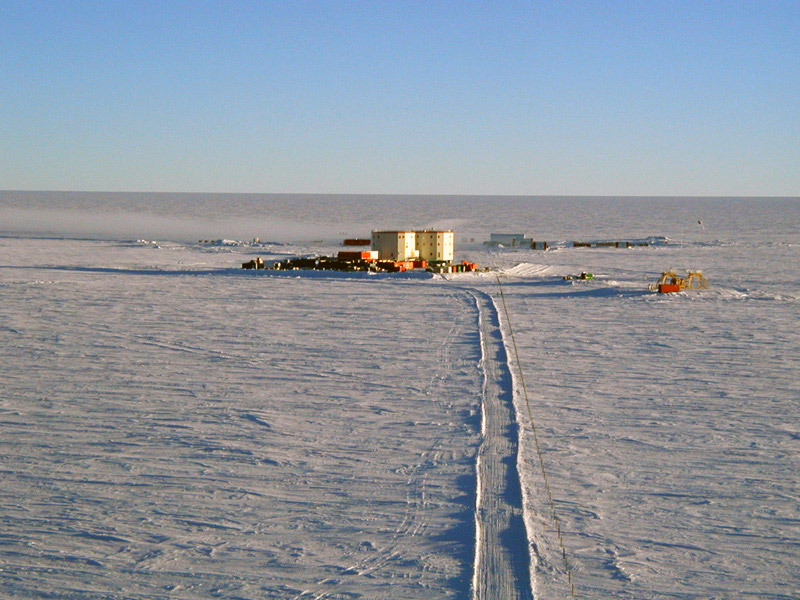 South Pole Observatory, view from the main station. This is a microwave and millimeter wave telescope. Click here for a virtual tour of the telescope. 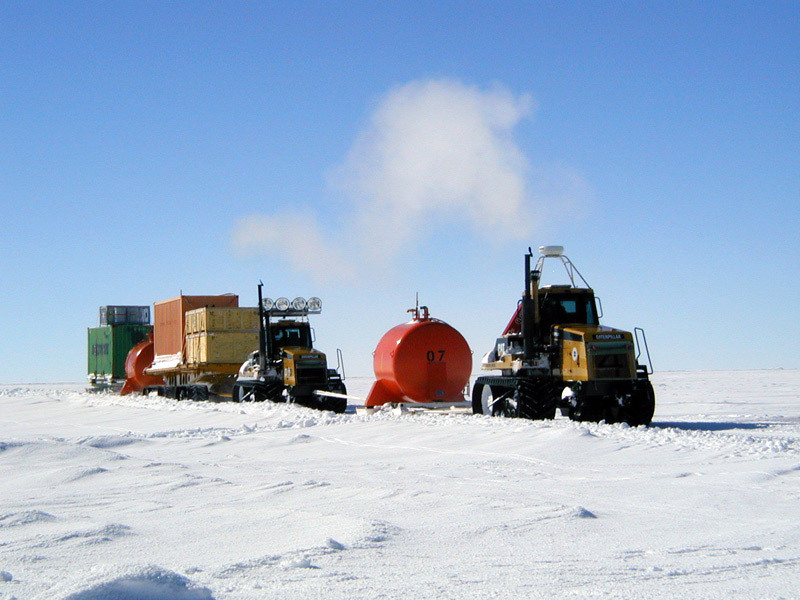 The South Pole is not the absolute best place for astronomy in Antarctica, but the logistics of supply have meant that this is where much Antarctic astronomy has taken place, at the American South Pole station. 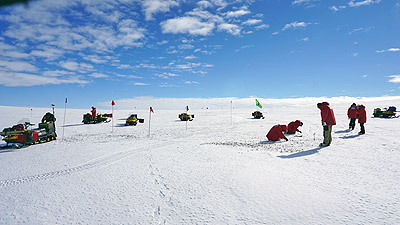 None of the currently research stations in Antarctica, whether occupied year round or during the summer only have been selected with astronomy as the primary motivation. An important aspect of conditions for astronomy is a lack of wind. Over Antarctica very cold air falls from the stratosphere and then when at the surface falls downhill, it flows from the highest points. These highest points are the "Domes" as shown in the map below. 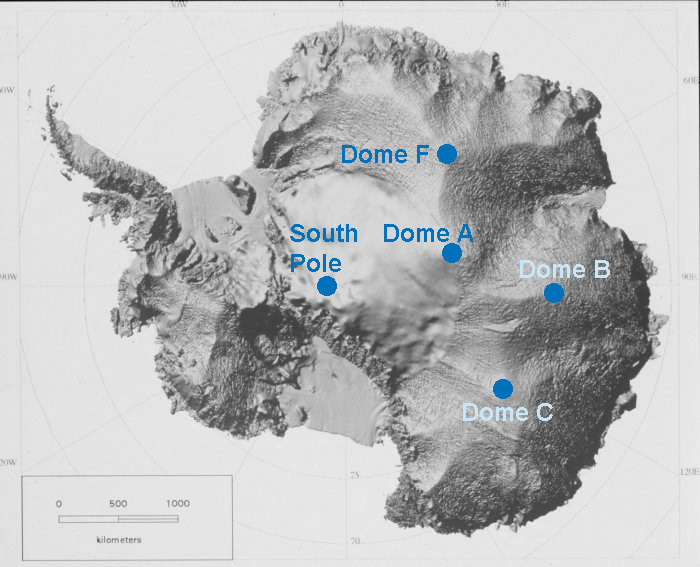 These domes are also the coldest places in Antarctica, they were initially visited for the purpose of taking ice cores and then subsequently investigated and found to be ideal for astronomy. They have the lowest winds and what wind there is forms a boundary layer that is 200m thick at the South Pole, though only 20-30m thick at Dome A, above this layer the air is extremely calm and extremely clear. The absolute best point is possibly a place called "Ridge A" a ridge that leads up to the top of Dome A, which has yet to be even visited. Dome A - Kunlun station - China. Highest point of the Antarctic plateau, summer only, robotic observatory, Chinese/Australian collaboration for a larger telescope planned for 2020 or shortly afterwards. Dome C - Concordia station - France/ Italy. Year round, no current observatory but there are plans to install telescopes. Dome F - Fuji station - Japan. Summer only, no current observatory, a possible site for future telescopes. South Pole Dome - Amundsen-Scott station - USA - Year round since 1956, 10m microwave telescope operational since 2007. 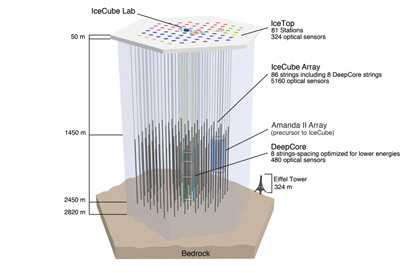 IceCube is the world's largest neutrino detector, It is buried beneath the ice at the Amundsen-Scott South Pole and occupies about a cubic kilometer of ice starting at 1.5km down so reaching to 2.5km from the surface. It consists of 5,160 highly sensitive and sophisticated detector units called digital optical modules or DOM's arranged on 86 strings that were frozen into boreholes. Cables reach the surface from the detectors and feed into a surface facility where the data they send is processed, it is permanently switched on. 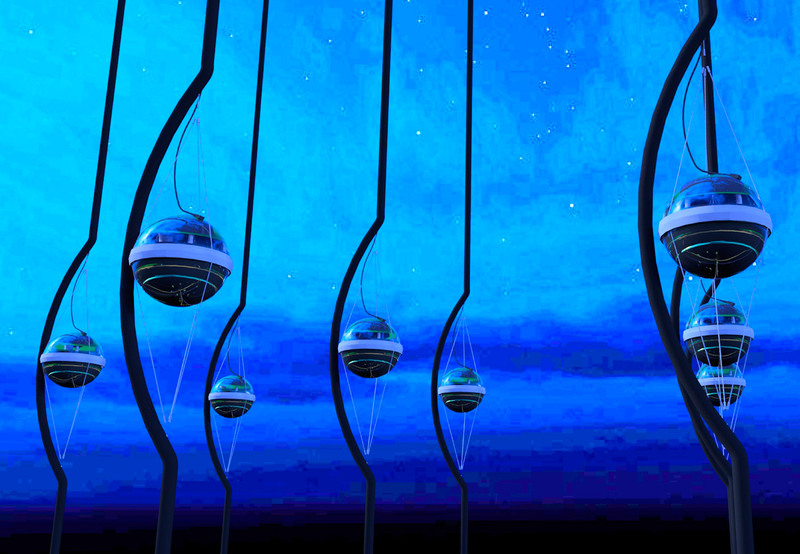 The neutrinos it detects come from the depths of space, some of them are ejected by the most violent events such as supernovae, the final death explosion of a massive star (stars need to be 8-15 times the size of our sun to form a supernova). 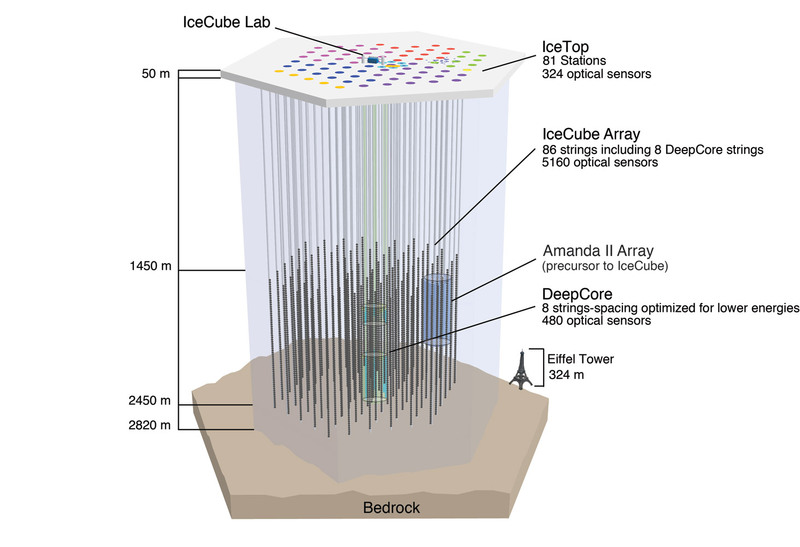 Neutrinos cannot be detected directly themselves and the gigaton (a thousand million tonnes) of very clear ice that is between the sensors is also a part of the detector. Neutrinos can only be detected when they collide directly with the nucleus of an atom in the ice to produce secondary particles that emit light, this light is detectored by the sensors, in this way the neutrinos and their path through the cubic kilomtre of IceCube is detected.. The surface facility where the information from the sensors is received and recorded. 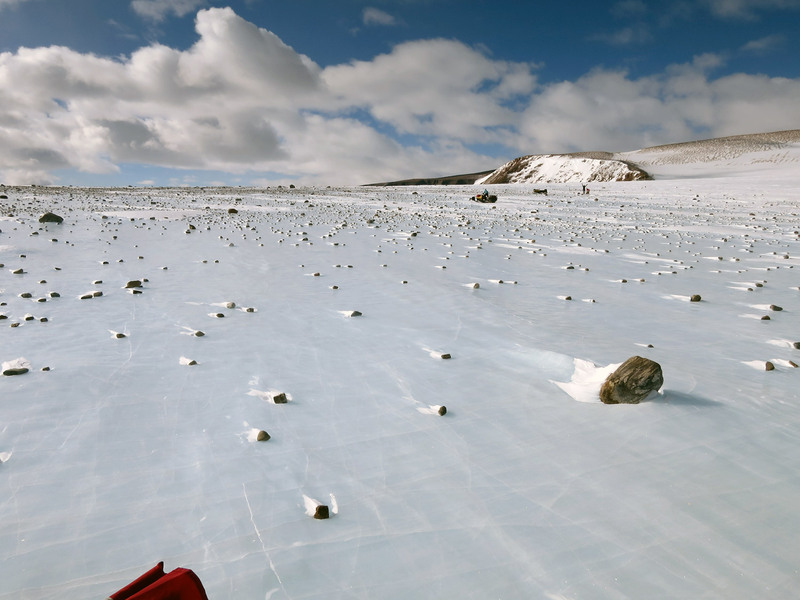 About 70% of all meteorites ever recovered have come from Antarctica. These are the remnants asteroids and comets which themselves are the remnants of planetesimals from the early days of the formation of the solar system and planets, these are the smashed up remains of objects that nearly became planets but didn't. A small proportion of the meteorites found have come from our Moon or even Mars following the collision with those bodies by other meteorites and some rocks being blasted off the surface into space before falling to earth. Like the other space science related studies described on this page, there is nothing specifically Antarctic about the collection and study of these meteorites other than it provides a good place to do so. The study of meteorites found in Antarctica helps us to understand the origins of our solar system and the evolution of the planets, they are rocky samples taken many millions of years ago and "stored" by flying around in space before finding their way to earth. 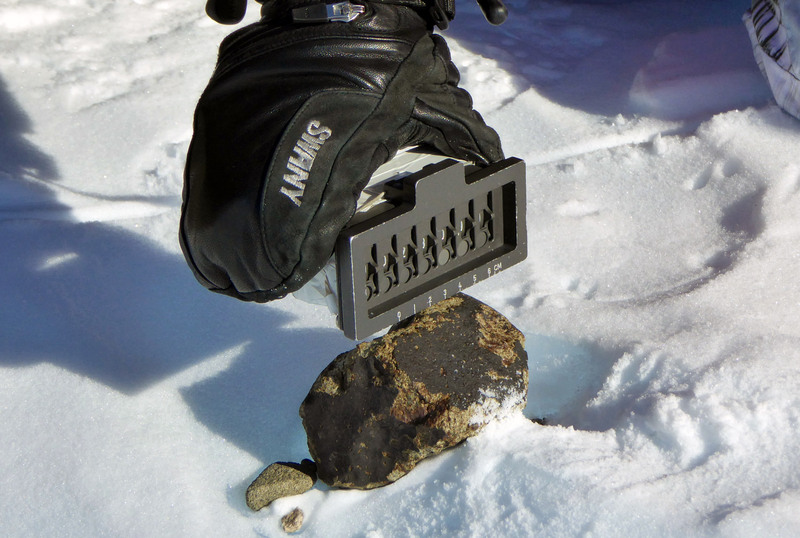 Why is Antarctica such a good place to find meteorites? The flow of glacier ice when it meets with an obstacle such as a mountain means that meteorites that had previously been deposited on the ice and had sunk into the surface are brought to the surface once again after the ice is scoured by wind. 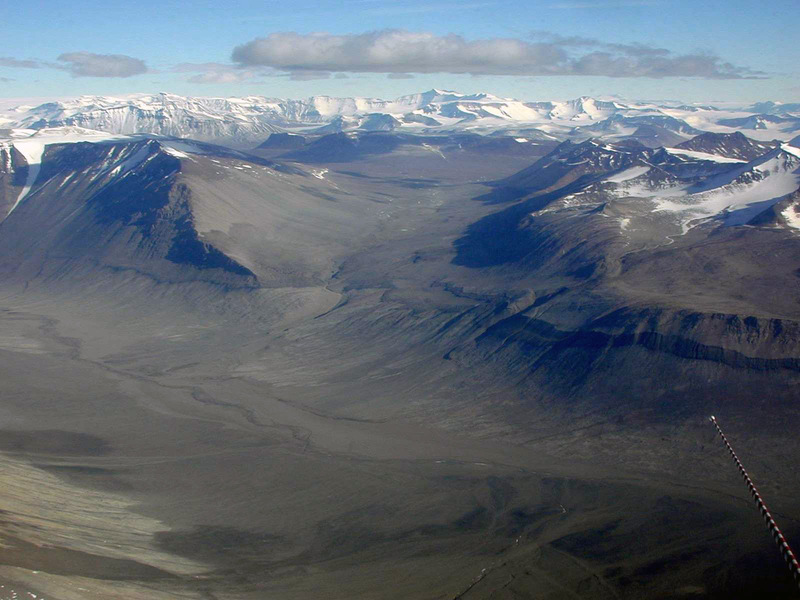 At a few specific areas amongst the Transantarctic Mountains, meteorites are concentrated together much more highly than anywhere else (though are still pretty widespread) these are known as stranding zones. In addition to this is the fact that meteorites are dark against a background of white, that there are few other rocks around and no vegetation for them to get buried amongst and it means that there are some prime meteorite hunting spots. Some countries, notably, China, Japan and the USA have programmes for the collection of such meteorites run by small groups of researchers and volunteers. Those collected are used for research and in education rather than being sold to collectors as are many meteorites collected elsewhere. 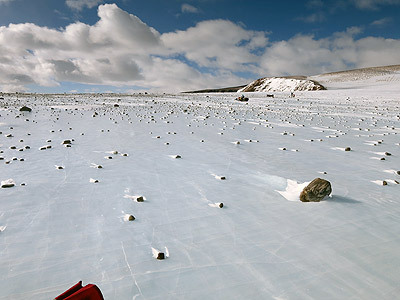 Despite the prime collection sites and efforts of dedicated collection teams, the vast majority of meteorites that fall on Antarctica still end up being carried in the ice down the sea. There is one kind of meteorite that is not found very often in Antarctica however and they are those that contain iron. Elsewhere, they represent about 5.5% of all meteorites found, but only make up about 0.5% of those found in Antarctica. The reason for this is thought to be that as this type reach the surface as it is eroded by the wind, the heat of the sun warms them up disproportionately and they melt down into the ice surface once more, and so may be below the surface out of sight most of the time. A sensing rig for these iron meteorites is being developed based on technology used to detect landmines that are buried just beneath the surface. Testing is due to begin in the 2018/19 field season with wider use the following year if it is successful. Such is the extreme nature of the Antarctic environment, it has been used as a testing ground for equipment to be used on the moon and on the surface of mars. The Dry Valleys region in particular with their extreme cold, winds and dryness are a good stand-in for the surface of Mars and so drills and rovers are tested here. 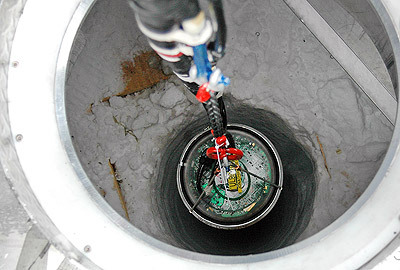 Despite the harsh environment, there is life in many unexpected places in Antarctica including deep under the ice in buried and isolated lakes, these are thought to be analogous to what may be found on the icy moons of Europa around Jupiter and Enceladus around Saturn where similar hidden lakes may be hiding. If life is found in these places beneath Antarctica, it may also be found on those moons, investigations are currently in the early stages.